Teaser Tuesdays is a weekly meme hosted by Miz B at ShouldBeReading where you randomly take two lines from your current read (spoiler-free) and highlight them in a post. This week's tease is from the contemporary YA novel Playing Hurt by Holly Schindler. "I actually start to feel a warmth break out under my rib cage. And just as I begin to realize that the warmth is actually hope--hope that Dad might actually be doing something thoughtful, that he might be giving me something I'd enjoy, like we were still the old friends we used to be before the accident--he says, "We spent a lot of money on this graduation gift of yours. I didn't want you to have to waste it sitting on a cabin porch." Blurb: Star basketball player Chelsea "Nitro" Keyes had the promise of a full ride to college-and everyone's admiration in her hometown. But everything changed senior year, when she took a horrible fall during a game. Now a metal plate holds her together and she feels like a stranger in her own family. As a graduation present, Chelsea's dad springs for a three-week summer "boot camp" program at a northern Minnesota lake resort. There, she's immediately drawn to her trainer, Clint, a nineteen-year-old ex-hockey player who's haunted by his own traumatic past. As they grow close, Chelsea is torn between her feelings for Clint and her loyalty to her devoted boyfriend back home. Will an unexpected romance just end up causing Chelsea and Clint more pain-or finally heal their heartbreak? 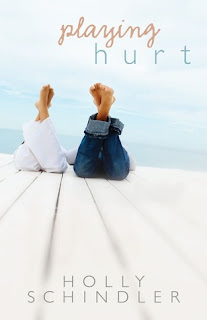 Playing Hurt by Holly Schindler, 303 pages, paperback, published by Flux, is available now. I liked this book a lot. Good teaser.